Hi all, and Happy First Day of Spring! 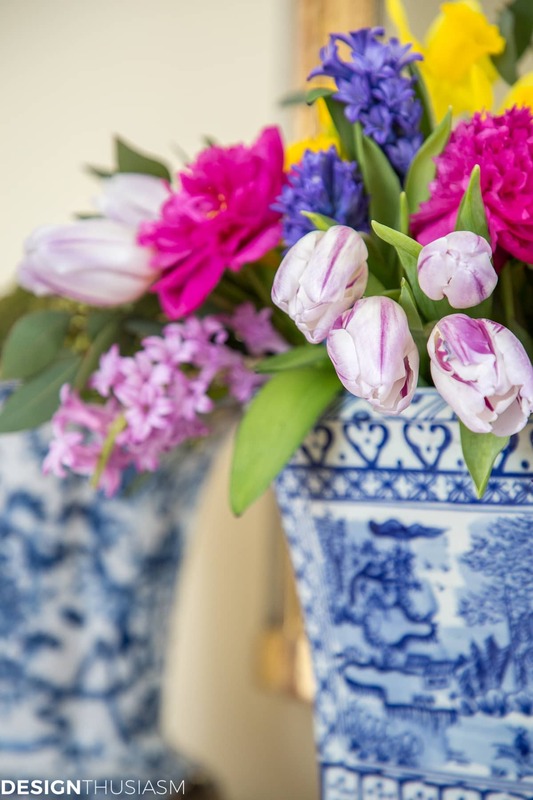 I’m so excited to be sharing my first spring home tour of the season, and I’m joined by eleven of my favorite bloggers who are also sharing their very best spring decorating ideas! If you’re landing here from my friend Lory’s, thanks so much for stopping by. She always has the most beautiful flowers, and I have a feeling this tour will be no exception! Spring is definitely special, don’t you think? There is just something about the blooming and re-birth of the earth that brings hope and cheer to the season, not to mention our yards. I’m a person who loves flowers any time of year, but with spring comes so many more favorites that I truly am in heaven! So, of course, my tour includes flowers. But it also includes simplicity. And a subtle elegance. 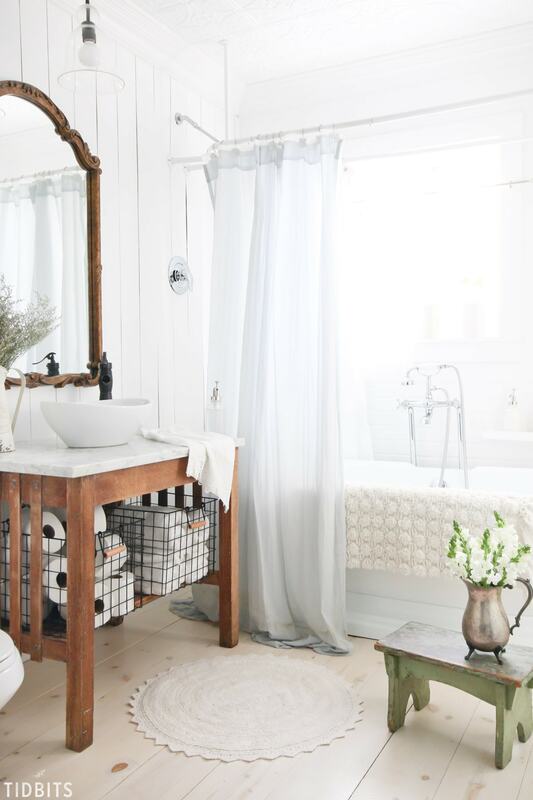 Spring decorating ideas don’t need to be complicated, nor overly “themed.” Plants, flowers, little nests or eggs – these are all things that say “spring” and don’t break the bank. The plants can last more than a season, as can the flowers if you buy potted ones vs. cut ones. These ranunculus are one of my all-time favorite flowers! And at least here in California, they are only available for a few short weeks so I’m practically running to get them as soon as they appear! I also added my vintage bird statue to the coffee table. 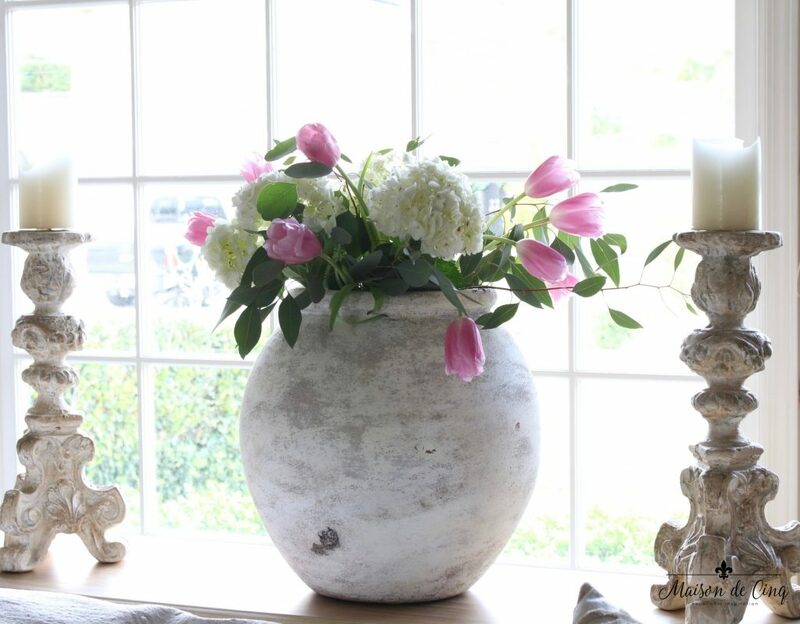 Bringing anything from the garden inside is always a good way to bring some spring into the house. 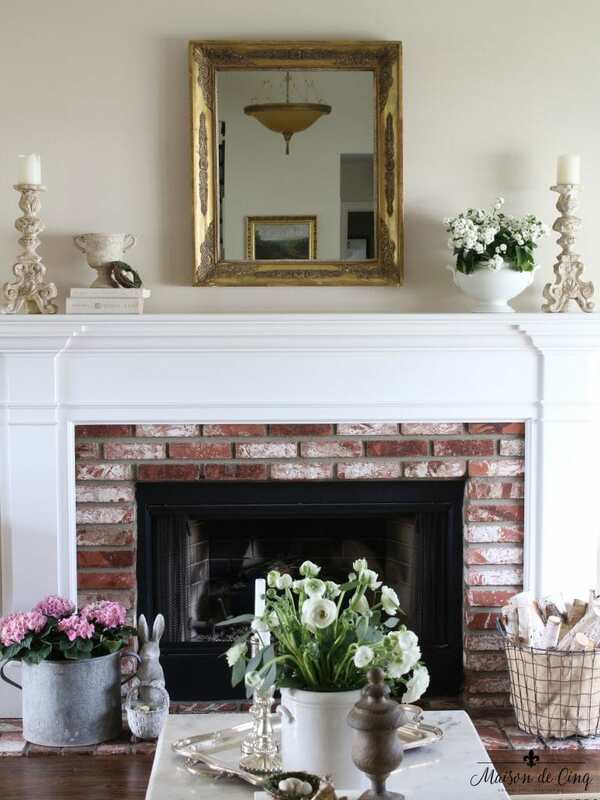 I just refreshed my mantel for spring last week. You can get all the details on my three versions in this post, but this is where I ended up. I love that it says spring, but in a subtle, simple way. I have orchids all year, but I do love the pink ones at spring. This one was a gift from a friend when I broke my back a few weeks ago, and I plopped it in a vintage urn and added it to the entry way. The other urn holds dried artichokes. 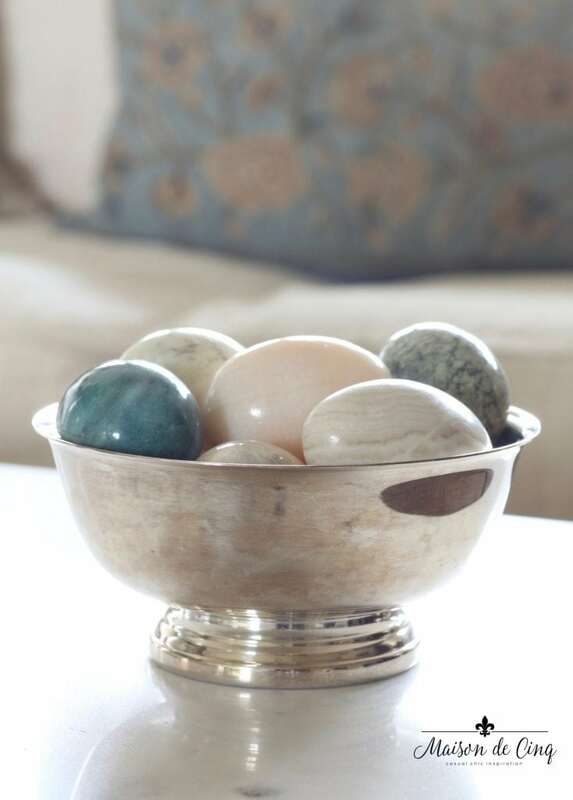 Something I’ve collected for years is these marble eggs! I bring them out every spring, and I love them. It’s really fun to buy just one or two new ones each year to build on the collection. You can easily find them on Ebay or Etsy, but Williams Sonoma also makes new ones that have gorgeous colors and they are a great price, too! 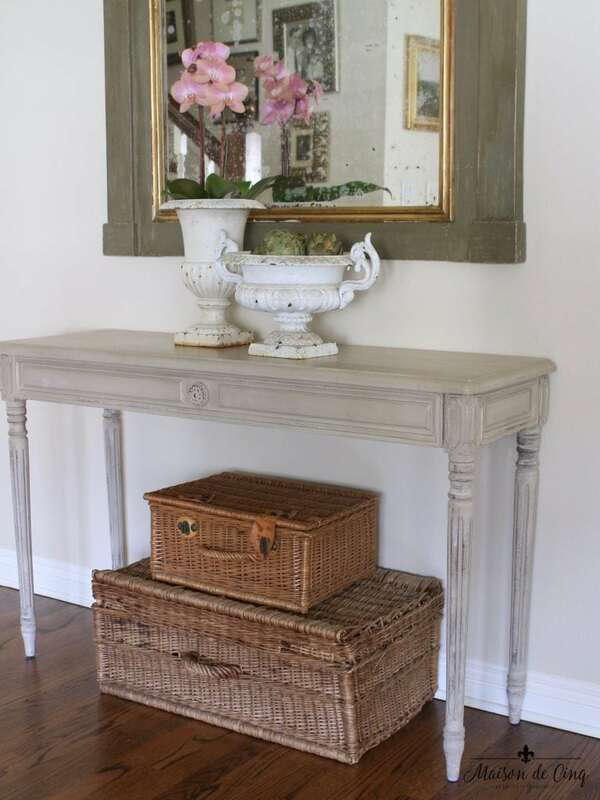 This antique French urn is a new purchase and I have to say, I was so excited to bring it home that I was giddy! I had looked at it in the antique store for probably two years, but finally made an offer and when the seller accepted, I knew it was meant to come home with me! It is so gorgeous, that literally everything looks good in it! 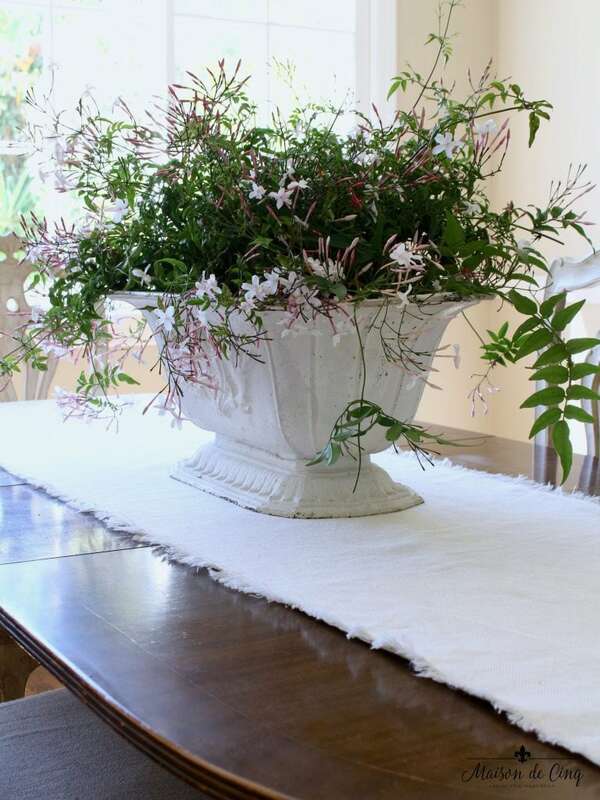 But I really loved the look of the jasmine – and it smells amazing! 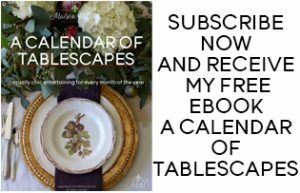 I hope you’ve enjoyed my first spring tour of the season, and that I’ve given you some ideas that you can use in your own home. 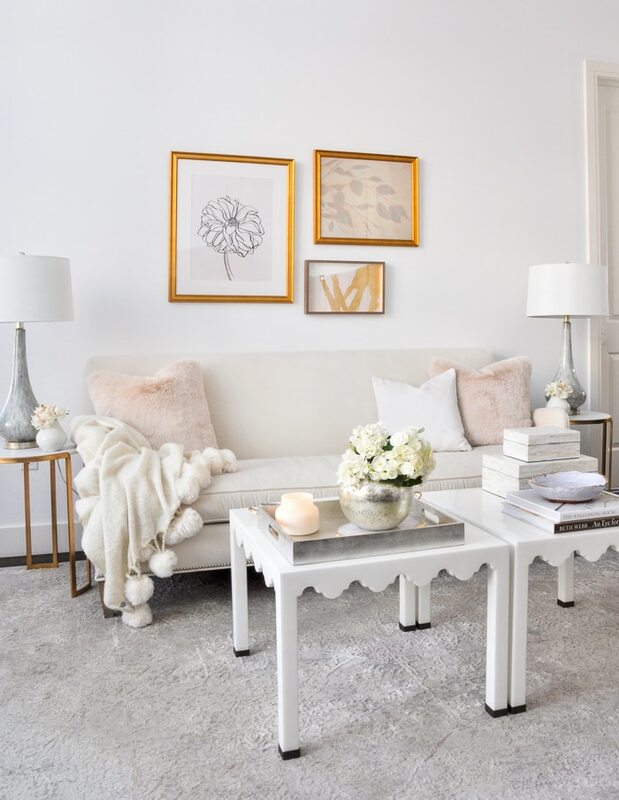 With some flowers and a few nods to spring, you can create an elegant but simple look that doesn’t break the bank, and that can last all season long! 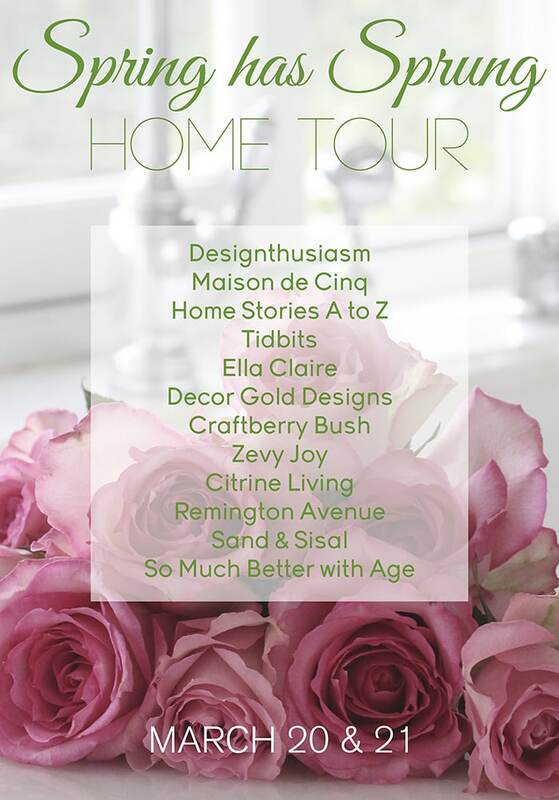 I’ll be sharing another spring tour next week of the other areas of my home, so stay tuned! 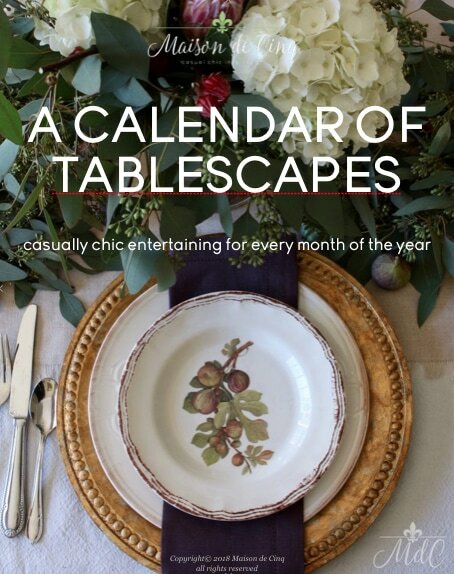 And if you want to check out last year’s spring kitchen tour, you can get to that here. 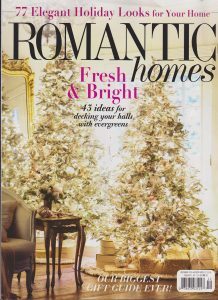 Now, pop over to Beth at Home Stories A to Z (you will love her gorgeous home!) 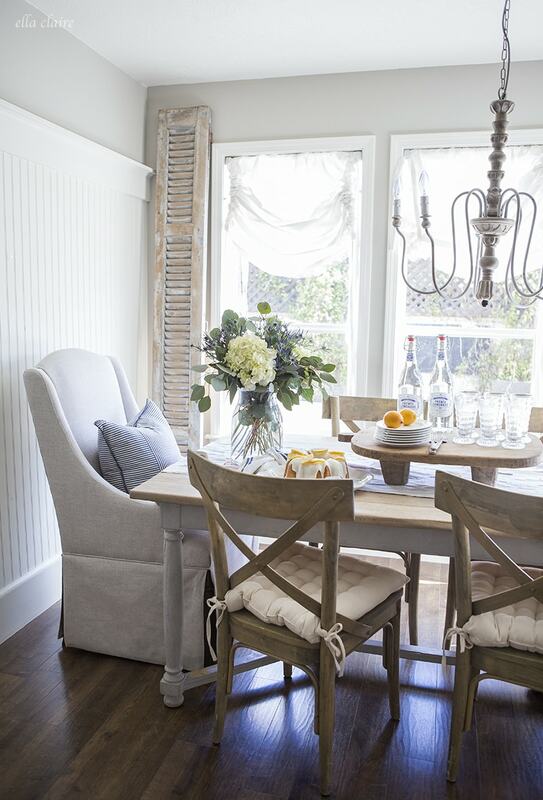 and check out her dining room decorated for spring, as well as the other talented ladies participating today! Also, don’t forget to stop by again tomorrow as there will be six more bloggers sharing their spring decorating ideas as well! Gorgeous! 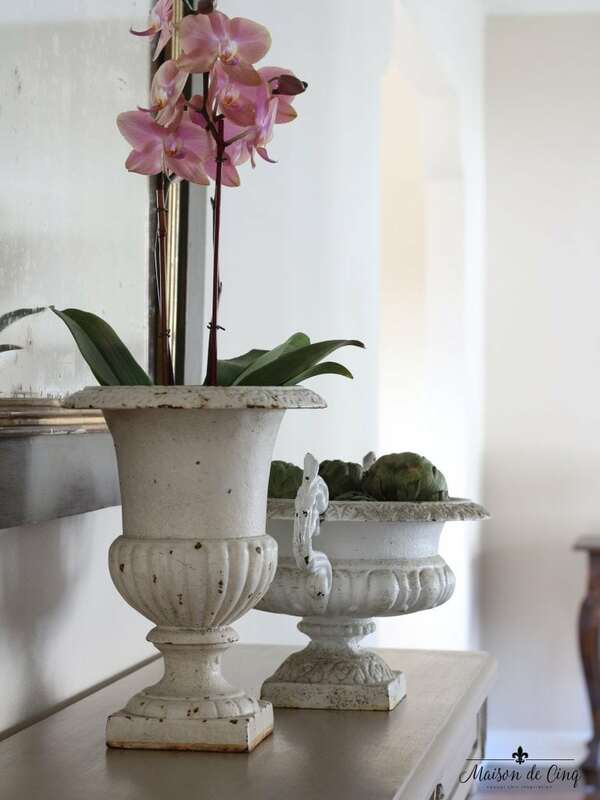 I love the orchid in the vintage urn! Everything is so gorgeous as usual, Sheila! I love those marble eggs. 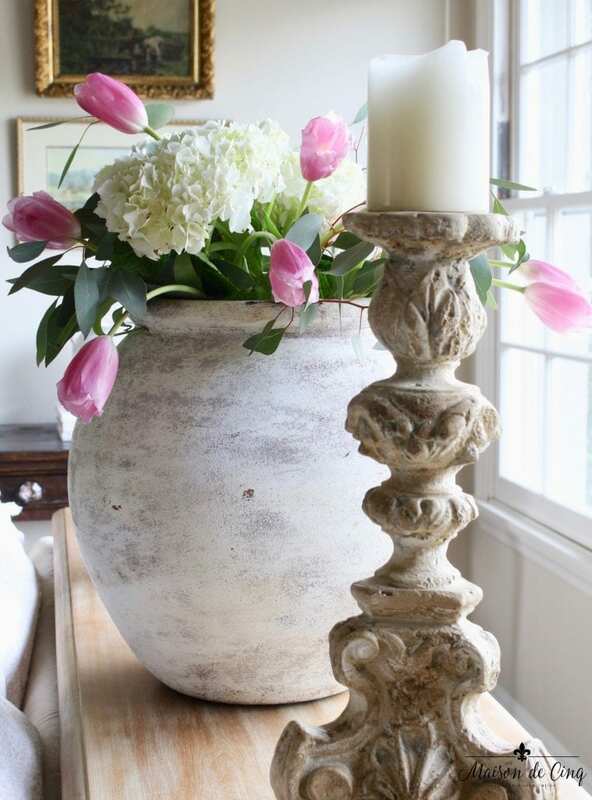 Your spring flower vignettes are just gorgeous and I love the different vessels that you used. Thank you for having me in this beautiful tour! Sheila I love all your florals and esp the marble eggs. I think I need some of those! Thanks so much Mysha! Looking forward to your tour tomorrow! 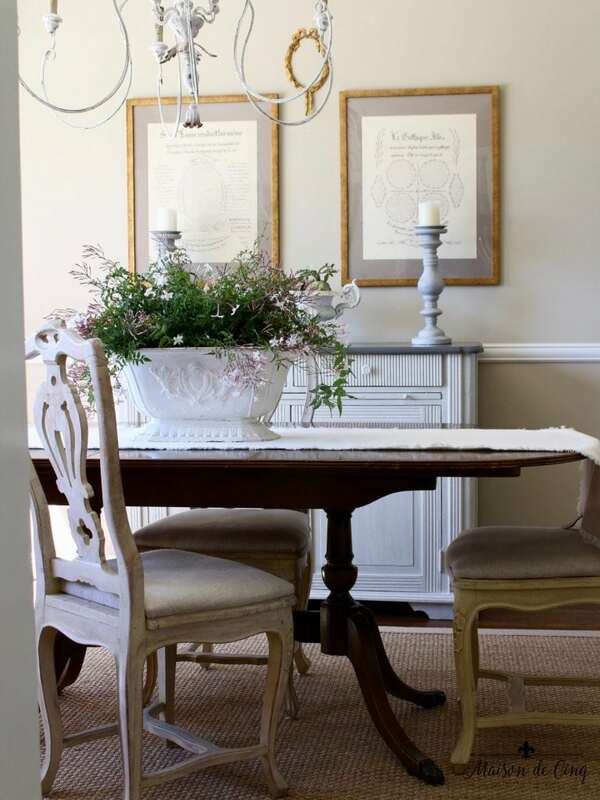 You have so many beautiful pieces and I especially love the way your dining room looks. Just gorgeous! Happy 1st day of Spring! Aww thanks Shelley! Hope you’re doing well! And really hoping your never-ending-winter ends soon! All of this is just so lovely, Sheila! I am especially in love with your new french urn. The arrangement in it is absolutely dreamy!! Loved the post and am enjoying the tour! 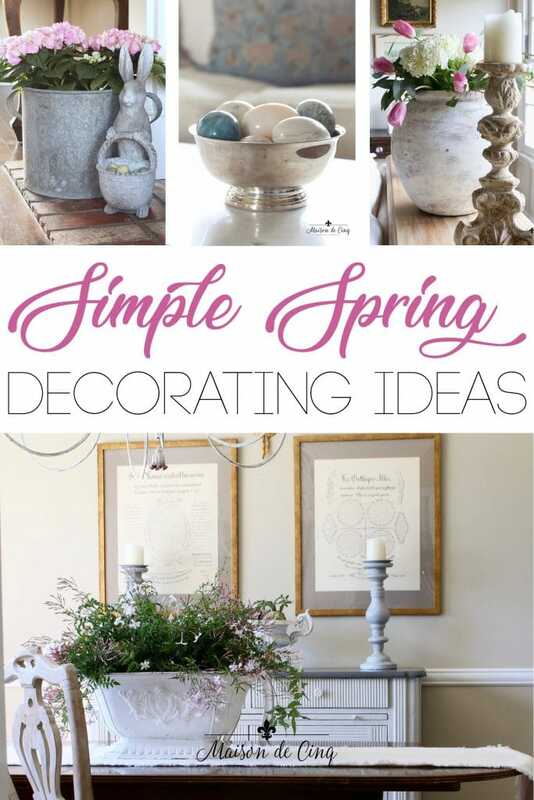 Sheila what a beautiful post filled with lovely spring ideas. I remember when we did the first “Spring has Sprung” blog tour together (can’t believe its been two years ago already!) 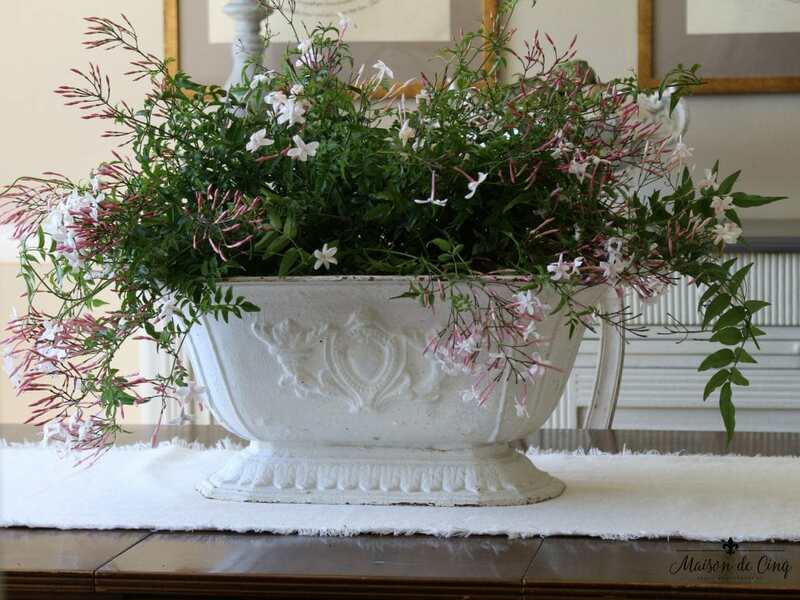 Love the french urn filled with Jasmine, so pretty! My gosh, yes! Two years ago – can you believe it?! Time really does fly! Sheila, what a lovely post. I remember when we did the Spring has Sprung tour for the first time together (has it already been two years ago!). 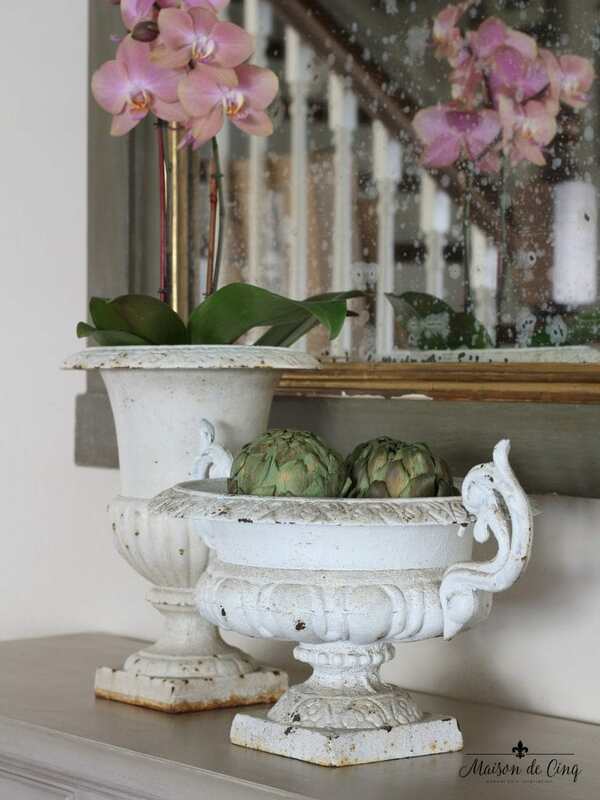 Love your birds, nests and stone urns but I especially love the new french antique urn filled with Jasmine, so pretty! What, you broke your back? I must not have been carefully reading. Hope it heals quickly and you will be up and running soon. Take good care. Hi Heather! I broke it a few weeks ago when I fell down my stairs! And thank you for inquiring – it’s already much better! Sheila, everything looks so pretty! Like you, I adore ranunculus and I am always sad when their short season ends! Your new find is amazing too! Thanks so much Jen! They are the most adorable flower aren’t they?! I just wish their season were MUCH longer! I love the subtle elegance of your home. 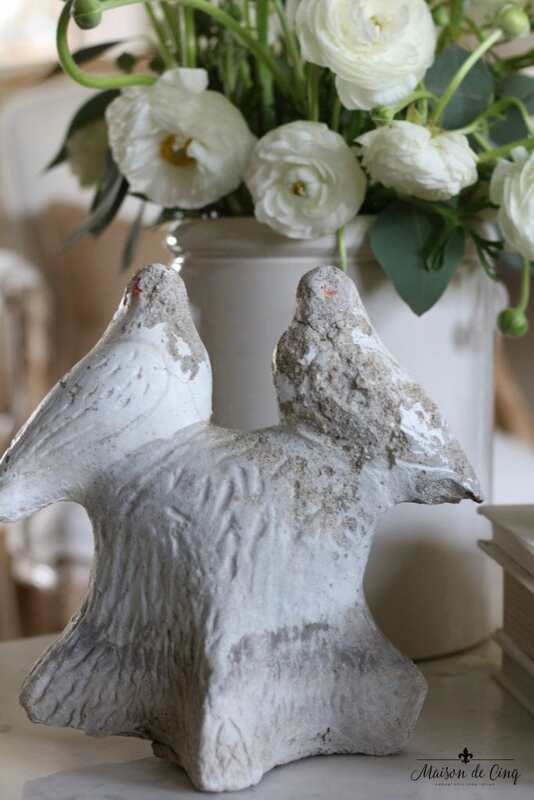 Touches of spring extend the welcoming tone of your home. The antique urn is exquisite. Covet worthy!!! Thank you for sharing. Beautiful. 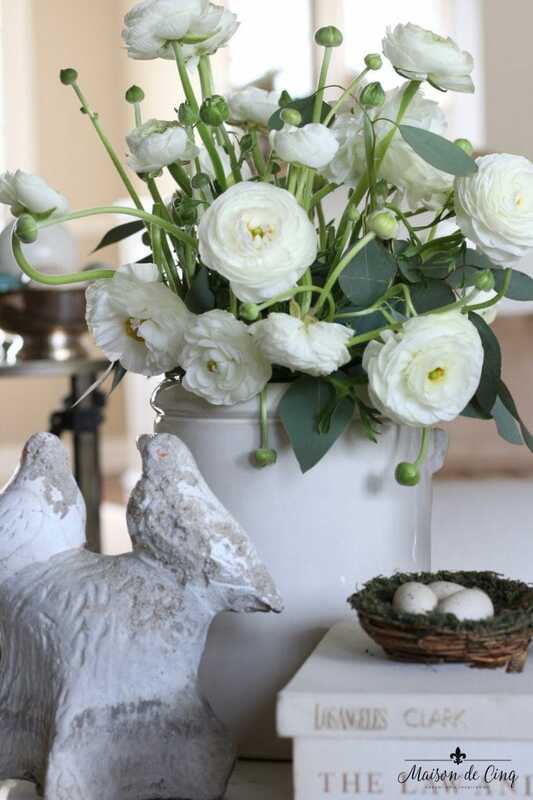 Those white rananculus flowers are simply gorgeous! We rarely can find them here too! Your home looks fresh and lovely for spring Sheila! I love ranunculus too, Kim! And they are soo hard to find! I’m not kidding when I say we have them for only a couple of weeks, and the women at Trader Joe’s clean them out everyday, too! And thanks so much for your sweet comment – can’t wait for your tour tomorrow! Sheila, your living room looks amazing for spring!! So soft and lovely! 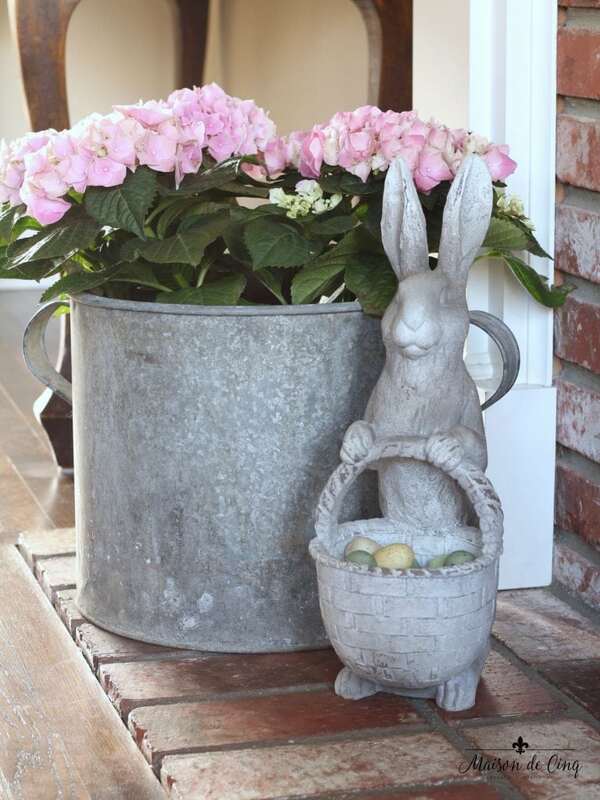 I’m crazy about your urns and planters and those marble eggs are awesome! Love everything about this post!! Aww thanks Lory! You’re so sweet! Aren’t the marble eggs the best?! I love finding new ones each year!